Great news for the Foundation and for our sponsored Dale Carnegie for Teens program! Author Dr. Edward Sarkis Balian, is publishing his 9th book titled “Turn the Page”, Bob Seger’s biography (available in January 2019). He is very generously donating 15% of the net proceeds to the Children’s Village Foundation, as it is Mr. and Mrs. Seger’s charity of choice. Bob Seger Sponsors Dale Carnegie program at Children’s Village for the third year in a row!!! Bob Seger has again sponsored the Dale Carnegie Teen Program at Children’s Village. Through his generosity, he is bringing life-changing skills to at-risk teens at Oakland County Children’s Village. The first class of 12 at-risk teens graduated from the Program in June 2016 with inspiring results. They learned public speaking and decision-making skills. Their self confidence grew every session. Most importantly, the students learned to replace negative attitudes with positive thoughts and actions. To read the full article published in the Detroit News, please click on the link below. A Christmas Ornament Party was held at one of the Girl’s residence halls on December 6th. Pizza and sweets were the foods of the day. A fun time was held by all. Check out the pictures of the beautiful ornaments the girls created on the “Photo Gallery” page. Oakland County Children’s Village Foundation is pleased to announce that Bob Seger has graciously offered to fund Dale Carnegie Teen Workshop for Children’s Village teens. What do Bob Seger and Dale Carnegie have in common? Both are playing a crucial role to bring needed life skills to troubled teens this summer, through the Dale Carnegie Teen Program at Children’s Village in Pontiac this July. “It’s an honor to be a small part of bringing this Dale Carnegie Workshop to Children’s Village. Our Son is taking the course and we saw the benefits after the first class! Click here to read the press release from Oakland County Executive L. Brooks Patterson. Click here to view the Channel 4 /WDIV press coverage of the graduation. Click here to read the Oakland Press Article. Due to the generosity of Comerica bank, fifty Children’s Village residents, parents and staff were guests at a recent Detroit Tiger baseball game at Comerica park. Adding to the excitement-nine lucky youth were selected to participate as the “Starting Nine”. 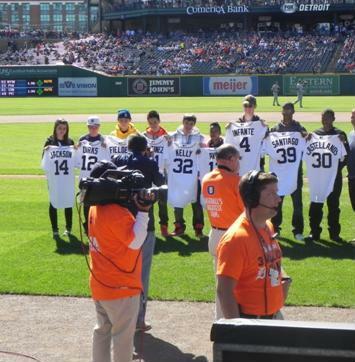 Nine youth were led onto the field, introduced prior to the game and each received an autographed jersey of one of the nine starting Detroit Tiger players. Comerica bank has been a long standing regional leader in community stewardship. The “Starting Nine” program is an annual recognition to honor and support young people according to Al Taylor, SVP National Director Bankcard Services for Comerica. Taylor was instrumental in securing the opportunity for the Children’s Village youngsters. From the terrific weather, baseball and hot dogs and drinks (courtesy of the Children’s Village Foundation who covered lunch for the entire group) it was a terrific day for all participants.